Maybe will have to add one of these to the collection of toys. Maybe retire the IMCO, although not sure about pricing of these which does not sound as good value as the Windsurfer LT, got one of those on order. Maybe Bruce will offer discounted boards/rigs to Australia to encourage growth of this new class here. 85 cm wide, 276 litre and just under 3 m long. Full carbon rig with 8.5 m2 sail. Board weighs under 14 kg. all seems very 2008 ..not that that's a bad thing . they were the Bush years. -"To the C students, I say you too can be president of the United States." I guess you could run a foil on it, noting it has a tuttle box, thereby bringing it into the so called "present". Given its volume at 85 cm wide maybe you could foil in 2-3 knots. Looks like a race board to me ?.. Unless you are a person of color in which case you won't even be hired as a manager at McDonalds. What the Mistral Prodigy/RS:X should have been. 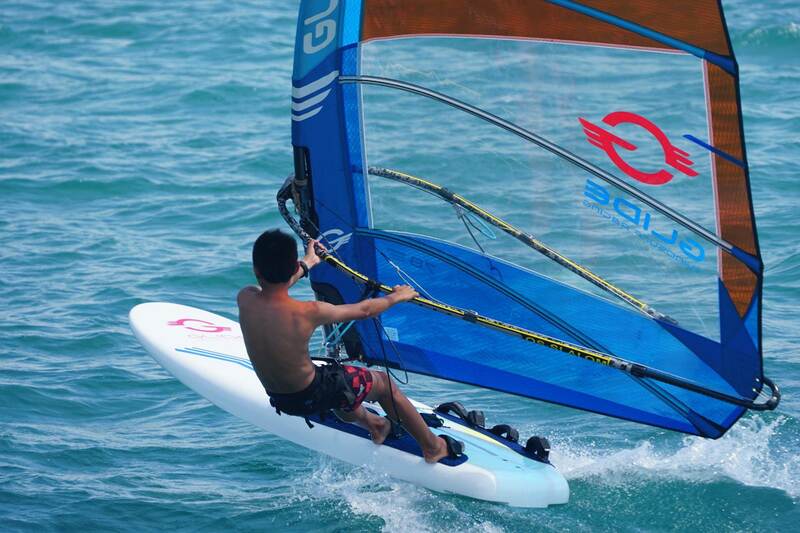 Richard G - as many windfoil boards are 85+cm, this won't foil any sooner. Source: mine is 90. America is not the world. Foiling at 85 cm should be achievable. How soon ? Well may you ask, but you have to be patient to fly. Indeed foiling without a "foil" is achievable on the daggerboard of a Mistral One Design at 63 cm wide ! Remember foiling has its own area on this website so best we not say anymore here. I don't have a foil anyway. Having lived on three continents, I'm well aware of what the world is. You had mentioned the possibility that this board could foil in 2-3 knots. It won't. I, too, have daggerboard planed on an IMCO and Equipe. Modern foiling is something completely apart, and I agree, doesn't need to sidetrack this conversation. This is a very interesting and, seemingly, well executed board that stands on its own merits. Yes agreed. I wonder if it is made with a foil box ? Is it 276L or 220L? The videos show a 220L board. The fin box is foil capable - but this board is not designed for foiling. A foiling board & rig needs to be as light as possible - so durability & cost is not the priority. Certainly a foiling board should not have a centre board or mast track. The Glide is designed to be durable & affordable while keeping the weight down as low as possible. It is a high performance course racing or touring board and can be a fun reaching board. 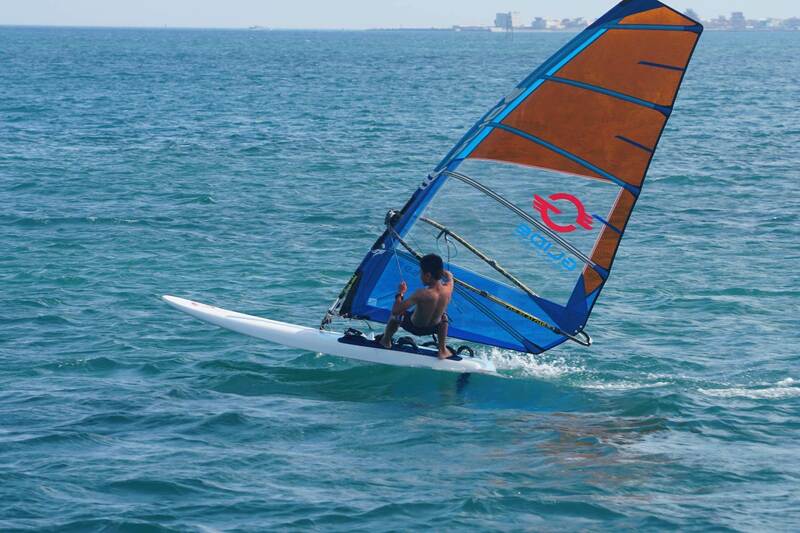 It is also really good for learning to windsurf. The text on the board in the video is wrong - the board is 276 liters. I taught a 98 kilo friend to windsurf in 15 to 20 knots with a 3.3 M2 & he up hauled sailed around the bay, tacked & learner gybed with only 1 or 2 swims. He was stoked. The stripes in the middle of the board are a good guide for a learners feet positions. "Length 2990cm - suitable for sailing up wind on fin, controlled jumping & air line transport"
sounds like it IS an airplane ! !